digital documentation and staff competencies. Revolutionize how you document and analyze rounds or audits in your healthcare organization. Highly configurable and workflow minded, the platform gives your leaders actionable insights to deliver on the spot service recovery and capture the voice of the patient and employee. From customized rounding maps to user level settings, we give you control to customize much more than just rounding forms. The end result is a software solution that is unique to your specific needs and goals. Reports for Healthcare Leaders. Not robots. We believe reports should be easy to access and quick to comprehend. From hospital-wide metrics to granular patient-level analysis users have access to an remarkable amount of data. We interface seamlessly with other clinical and third party applications to create a more integrated solution and a better end user experience. We take our industry knowledge and clinical expertise to provide a human analysis of your data. You'll meet with with our team quarterly to set goals, review data, and measure them against benchmarks — all with the goal to continuously adapt and make improvements. Learn why thousands of peoples use the Nobl Rounding Platform every day to document, track, and analyze hundreds of healthcare processes. 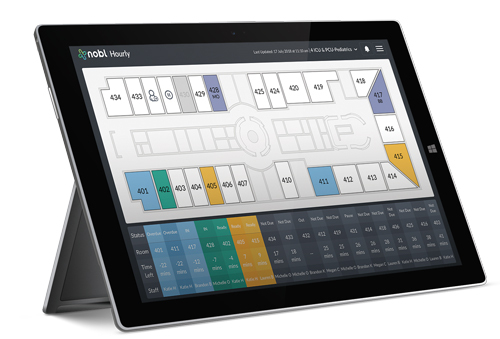 Tell us about your organization to get a hands-on look at the Nobl Rounding Platform. Nobl is excited to be offering another complementary educational webinar.